Kuala Lumpur, 5 November 2009 – The introduction of the recently completed Pavilion Residences Tower 1 into the Malaysian property market offers the public one last chance to enjoy 43 floors of unparalled 6-star luxury living within the heart of Kuala Lumpur’s Golden Triangle. Occupants of Tower 1 will be in world-class company, as it is located on top of the awardwinning shopping centre Pavilion Kuala Lumpur, which received the World’s Best Retail Centre’ by the FIABCI Prix d’Excellence Awards 2009. Tower 1 is also part of an integrated landmark development, which will be home to Raffles Kuala Lumpur, a 200 luxury room hotel and suites,as well as a premier corporate office block. IMMO Pavilion through a German-based fund owns Pavilion Residence Tower 1. The fund sits under SEB’s stable of funds and invests in various properties asset classes across Asia. The asset manager for Pavilion Residences Tower 1 is Pacific Star. Months prior to the launch, Pavilion Residences Tower 1 sold over 50% of its 163 units. The overwhelming response for this exclusive address reflects a refreshing change for Malaysia’s property sector now recovering steadily from the global downturn. Mr. Ng added that Malaysia holds unique strength in promoting cosmopolitan living in the country with the active promotion of the ‘Malaysia My 2nd Home (MM2H) programme which awards MM2H participants with silver identity cards similar to those for Malaysians. The Liberalisation policy advocated by the Malaysian Government which eases restriction of foreign investment into Malaysia and the various measures undertaken by the recently set-up Malaysian Property Inc (MPI) to woo Foreign Direct Investment into the local property market has made Malaysia an attractive destination for investors. Following the launch, Mr. Ng led guests and members of the media on a tour to view the suites available in Pavilion Residences, Tower 1. Guests were given a first-hand look at the luxury fittings and attention to detail given to every nook and corner of the residences. All units at the residences come complete with spacious en suite bathrooms, air-conditioning and high quality fittings and finishing, including marble and timber flooring. The three-bedroom and larger units also have wet and dry kitchens that come fully equipped with appliances such as hob, hood, oven, microwave oven, refrigerators, washer, dryer; built-in wardrobes and a powder room. These elegantly designed units, with its specially designed windows throughout the entire development, create an opulent yet homely setting that offers an oasis of calm and serenity right in the heart of the Golden Triangle. Guests and members of the media were treated to an evening of 6-star experience which included pampering sessions at the poolside, situated on the rooftop of Pavilion Kuala Lumpur,courtesy of brands at Seventh Heaven, Mary Chia, Slimming Sanctuary, Bizzy Body and 128 Faubourg Salon by Sothy, all tenants at Pavilion Kuala Lumpur. CYBERJAYA will undergo a face lift in the next two to three years to make it a more vibrant city. Cyberview Sdn Bhd managing director Datuk Redza Rafiq said the expansion mooted under the 2010 Budget includes having affordable housing, business complexes, hypermarkets, parking lots, recreational centres and also schools. "There will also be more efficient public transportation service and efforts to increase business, commercial and recreational activities will also be intensified. "We plan to invest RM58 million in the next few years in green technology as well," he said at the Cyberjaya annual media briefing yesterday. The company has submitted a strategic plan as well as a green roadmap to the government for the implementation of green initiatives in Cyberjaya. Cyberview and other stakeholders will add 2.16 million square feet of space by next year. PETALING JAYA: The Association of Banks in Malaysia (ABM) has refuted there was a price war brewing in the pricing of mortgage rates. Responding to an English daily quoting research house HwangDBS Vickers as saying that banks had agreed to end the mortgage price war, among others, by standardising rates, ABM said: “There cannot be standardisation of mortgage rates by the banks. Interest rates for housing or mortgage loans are to be determined by the individual banks in line with their funding cost, business strategies or business model. It said it was unable to make any further comments, adding that if banks were unable in the first place to standardise rates, how could they agree to end the mortgage war. StarBiz recently reported that lenders like Maybank, Public Bank, Standard Chartered Bank, Alliance Bank and EON Bank had revised upward their mortgage rates to base lending rates (BLR) minus 1.8% from BLR minus 2%-2.3%. At the same time, some banks no longer absorb the legal fees on loan documentation which is now, borne by consumers. However, an industry source and several analysts agreed there was some sort of consensus reached among the banks on a cordial basis to standardise mortgage rates even though each bank has the right to determine its rates. Industry observers expect other banks too to follow suit in raising rates to boost their net interest margins in view of marginally slower loans growth. Some foreign banks are still maintaining their previous rates. It is also learnt that among the foreign players, Citibank and HSBC Bank have to date not raised their mortgage rates, but may be pressured to do so in the coming weeks. “Markets have a tendency to do that. Clearly, pricing of mortgages had been driven to uneconomic levels. Rationality has come back to the pricing of mortgages. I support rationality in pricing,” he said yesterday after the signing ceremony for Genting Bhd’s 10-year medium-term notes programme. Property developer Malaysian Resources Corp Bhd (MRCB) plans to raise up to RM566 million from a rights issue and use about two-thirds of the money for future expansion. It said RM380 million would be for future business investments and expansion of its core activities. This would include buying prime land for development, investment opportunities in strategic property development, expansion in environmental engineering and infrastructure business opportunities. MRCB told Bursa Malaysia that it expects the corporate exercise to be completed in the first quarter of next year. It will offer as much as 483 million new shares at an issue price of RM1.172 each. MRCB closed 1.4 per cent down to RM1.39 yesterday. The basis for the proposed rights issue is one rights share for every two existing MRCB shares. The Employees Provident Fund, which holds 30.6 per cent of MRCB, has promised to take up its portion and it could also buy other rights shares not bought by other shareholders. It may even make a mandatory general offer for the rest of MRCB if it breaches the 33 per cent level, MRCB said. MRCB said it will use RM85 million as equity investment in its 51 per cent owned Nu Sentral Sdn Bhd (NSSB), a joint-venture company between MRCB and Pelaburan Hartanah Bhd. 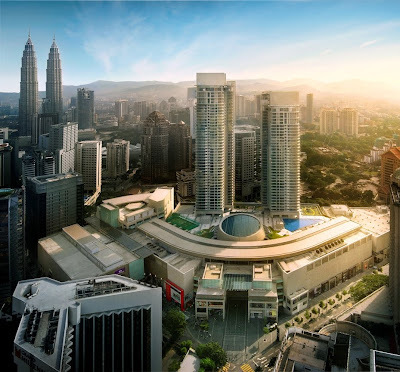 NSSB was formed to buy and manage Nu Sentral, a seven-storey retail mall within the Kuala Lumpur Sentral development now under development and covering a gross floor area of about 1.2 million square feet. It is due to be completed by 2012. The RM800 million retail mall will be funded by equity investments and bank borrowings. So far, MRCB has invested about RM38 million in Nu Sentral. The remaining funds of the rights issue would be used for working capital and expenses for doing the rights issue. KUALA LUMPUR: Rationality has returned to the pricing of domestic residential mortgages after being gradually driven to “uneconomic levels” in recent times, a top banker said yesterday. However, CIMB Group Holdings Bhd group chief executive Datuk Seri Nazir Razak denied the banks had met and agreed to end the mortgage war but that the upward revision of mortgage rates was the result of each bank’s decision to act “rationally”. “Of course we have conversations with each other, banks look at each other; but the point is that mortgage rates have been driven to uneconomic levels,” Nazir told reporters after a signing ceremony to mark Genting’s pricing of RM1.45 billion 10-year medium-term notes. CIMB Investment Bank Bhd and HSBC Bank Malaysia Bhd are the joint lead arrangers and joint book runners for the MTN programme. In denying that there had been any particular trigger or catalyst for the banking industry as a whole to revise mortgage rates upwards, Nazir said when irrationality prevailed and subsequently one player decided to act “rationally”, the others would follow suit. He added that the low rates offered by most banks in recent years had potentially dangerous implications for the banking industry. He warned that if mortgage rates were priced wrongly, it would come back to haunt the banks in five or six years’ time, especially with regard to potential credit losses which would have to be borne by the banks if they failed to build a buffer to manage non-performing loans. “If they don’t build up the reserves to bear the credit cost in the long term, it will be dangerous for the banking sector,” he said, adding that the world had seen the effects of irrational pricing in the US mortgage market. “I support rationality in pricing,” Nazir said. OSK Research on Wednesday said banks had in general agreed to raise the average mortgage rates from BLR-2% up to -2.3% to BLR-1.5% to -1.9%. BLR is base lending rate. The research house pointed out that mortgage products were priced as high as BLR+1% in the early 2000s and had declined to as low as BLR-2.4% of late. It viewed the move in a positive light in terms of net interest margins (NIMS) as margin enhancement would offset the potential impact of marginally slower loans growth. However, OSK Research cautioned that “there is no guarantee that irrational competition will not recur”. In another report, HwangDBS Vickers Research also said banks had agreed to put an end to “the mortgage price war” but were still offering attractive rates for new launches. It had said some banks had started raising rates for new applications. “At BLR-2.4%, it effectively takes banks at least two to three years to break even. BLR currently stands at 5.55%, while average cost of funds for banks is 2%,” it said. HwangDBS also said every bank would be able to price products depending on their respective cost structure and also incidence of default. It has been reported that banks are moving towards risk-based pricing in determining mortgage rates and as such, may charge borrowers different interest rates based on factors such as credit score, wages and employment, and even the type of property. “For a customer with a healthy credit profile, it is possible for the bank to offer him/her an attractive rate,” HwangDBS said. Meanwhile, Nazir also said demand for loans would be affected by several factors, including the soon-to-be reinstated 5% real property gains tax (RPGT). He added that there was also “some softening of mortgage demand”, which he said “may be a good thing, because [we] don’t want the [real estate] market to bubble”. On his outlook for mortgage loans next year, he said it was “difficult to tell” especially with the significant changes, such as the reimposition of RPGT.